One of the concerns that many people have when considering a move to the cloud is that of granular control. The last thing an organization wants is to open the flood gates to uncontrolled performance, cost or poor efficiency. Sensible Cloud is trying to deliver on these concerns and is today releasing ControlMyCloud to public beta. ControlMyCloud is a SMB focused offering that aims to control infrastructure optimization, bill control and business continuity. 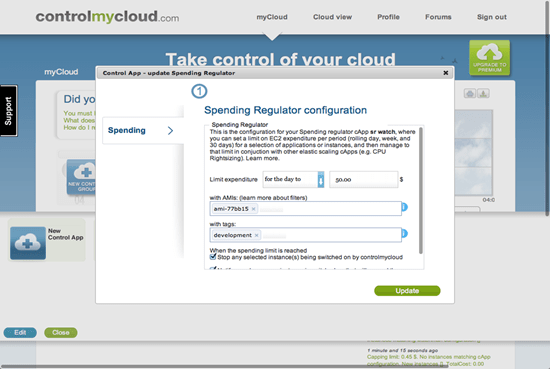 Disclosure – Some parts of what ControlMyCloud does relate to cloud spend management and are in competition with Cloudability, company that I’m an adviser of and investor in. This review was made at arms length and ControlMyCloud offers significant areas of functionality unrelated to spend management. ControlMyCloud.com is a series of template control applications, delivered via a secure web interface, currently able to manage and control the cloud operations of a user’s Amazon EC2 environment (and with plans to include other vendors in the future). The idea of ControlMyCloud.com, is that customers can manage the cost of public cloud services and match those services to required performance metrics, without having to constantly monitor and manually adjust their IaaS solutions. It’s a real world solution to the ineffective tool that an SLA can be – many of have long argued against the SLA as an effective performance tool for the cloud – solutions like ControlMyCloud give organizations the visibility and the control over the things that SLAs are meant to deal with. 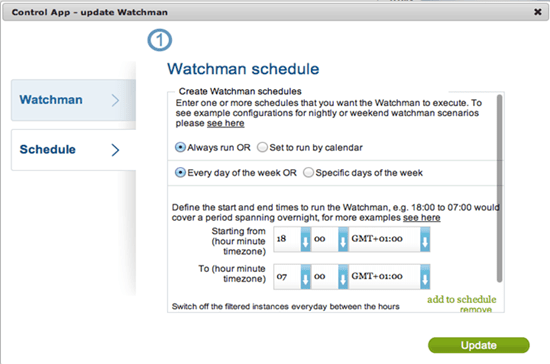 ControlMyCloud works via the notion of the “watchman” essentially a combined monitoring/management tool that take pre-defined policies and sets KPI thresholds within a constantly monitored SLA framework. The service then adjust cloud resources up or down to maintain the optimum mix of service and resource use (ie cost). I’ve long thought that an integrated monitoring and management platform is a good approach for companies seeking to ensure high performance from their cloud providers. Of course with its existing support for only AWS, ControlMyCloud still lacks the multi vendor functionality that would make their offering even more valuable, I’m looking forward to seeing what they do once other infrastructure vendors are dropped into the mix.